Arguably the most appealing feature of Permai Chalet Tioman is its location, the east coast of Tioman Island, along the beach near Kampung Juara. Now, this Juara Beach isn't just any beach. For one thing, it's Tioman we're taking about, so naturally the surroundings are nothing short of breathtaking. But as if that isn't enough, it so happens that Juara Beach has been named one of the best beaches in the world. In fact, Juara landed an enviable 21st position on CNN's World Best 100 Beaches list. Those are pretty serious bragging rights. And Permai Chalet Tioman is right in the middle of this beach. Can't really go wrong there. Best of all, our view was of this very beach. Life's good at Permai Chalet Tioman. We came to Permai Chalet Tioman, because we liked the description we found online. But in all honesty, when we arrived at Permai Chalet Tioman, it was clear that the online details didn't do Permai Chalet Tioman any justice. Permai Chalet Tioman really is awesome. If you're after some quiet time in Paradise, then Permai Chalet Tioman will more than tick that box. What's not to like about being sandwiched in between one of the world's best beaches in front of you and a simply stunning, luscious, tropical backdrop behind you? There is raw, powerful and unspoiled beauty everywhere you look. Amazing panoramas all around. More about this later. Ok, what about Permai Chalet Tioman itself? Well, we knew from the start that Permai Chalet Tioman isn't a, exclusive resort-type accommodation. If that's what you're after, if you can't live without 5-star dining, 24-hour room service or a little chocolate on your pillow, then Permai Chalet Tioman probably won't be your thing, spectacular scenery or not. But if you're looking for a basic less-is-more chalet that's bathed in sensational bliss, then you will love Permai Chalet Tioman with a passion. We did. Did we also like the actual Permai Chalet Tioman room? Well, it's one of only chalets on offer by Permai Chalet Tioman and as it was off-season when we stayed here, it was tranquillity galore. But yes, the room is basic; there's a queen-size bed, a little desk, a fridge, a closet, a wide-screen tv and a kettle with some mugs. Also, towels are provided. But that's about it. But whilst the room is indeed no-frills, it does offer aircon and a hot-water shower. A fair number of accommodations in Tioman don't have these, but happily, Chalet Tioman does. Is there anything we found could be a little better? Well, we know that you can't have ultimate serenity with easy accessibility, but it would have been absolute full marks for Permai Chalet Tioman if it had its own ferry service. As it stands, Permai Chalet Tioman guests need to disembark the ferry at Kampung Tekek and then take a 4x4 to Juara. This cross-country 30 minute ride is nothing major. But how cool would it be to just hop off the ferry and straight into your room? The other thing that's conspicuously missing at Permai Chalet Tioman is wi-fi. If you must log-in every now and again, you'll need to do it elsewhere. There are some stations not too far off Permai Chalet Tioman, but in all likelihood, bandwidth won't be superior. Getting around is mostly by vehicle (read: taxis) but they're pretty affordable, so give them a go. If you want to try your hand at snorkeling, then there's little boats that can take you to the snorkeling locations of note. There are some just off Juara, but there are also a few doozies on the Tioman west coast. Pulau Renggis, in particular, was quite impressive. Given the great RM exchange rate, our entire stay turned out to be a steal, specially considering the ultimate idyll that Permai Chalet Tioman offered. 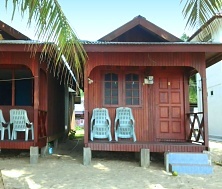 Tip: At just 2 chalets, it makes sense to book Permai Chalet Tioman online. If it's not listed, try Airbnb. Looking for a hotel in Malaysia?